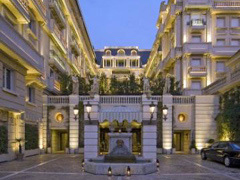 5 star hotel, situated just a few steps from Monte-Carlo’s legendary Grand Casino. Both the interiors and exterior were re-designed by world famous architect Jacques Garcia. Whilst the exterior of the property and its overall ambiance remains classic in style, Garcia has added a modern twist, ensuring that the hotel is set apart from the other Casino Square properties. The chic bar and lounge area offers all-day dining and gourmet restaurant under the expert guidance of globally renowned Joel Robuchon where you can enjoy a bird’s eye view of the Grand Prix circuit and the sea beyond. 141 rooms, including 64 suites redesigned by star Architect Jacques Garcia. The fitness centre features most modern gym equipment and for those seeking total relaxation, a luxurious spa by ESPA provides a haven of tranquillity with many blissful signature treatments available in its 10 treatments rooms including 2 VIP Suites. In addition, the spa also offers a ‘heat experience’ with saunas and steam baths. A real hot spot in Monte-Carlo, the hotel offers the only outdoor heated seawater swimming pool on Casino Square, fabulous for both lazy days and star-filled nights. The swimming pool has its own bar and restaurant, which is surrounded by a superb teak sun deck for further relaxation. 1,900 square feet of WI-FI equipped, soundproof meeting space consisting of: one conference room ,one banquet room, one board room. Nice Cote d’Azur International Airport links the Principality of Monaco to more than 86 destinations worldwide. Travelling by car taking around 45 minutes. The fastest method of transfer from the Airport to Monaco is by helicopter, just a seven minute ride. All trains stop at the Monaco / Monte-Carlo station which is close by. The TGV journey to and from Paris takes 5 ½ hours, and there are direct connections to Milan, Genoa or Basel during the day, as well as overnight trains to Strasbourg, Paris, Toulouse, Irun, Port-Bou, Milan, Venice, Pisa and Rome. Regional express trains connect all main cities on the Cote d’Azur.